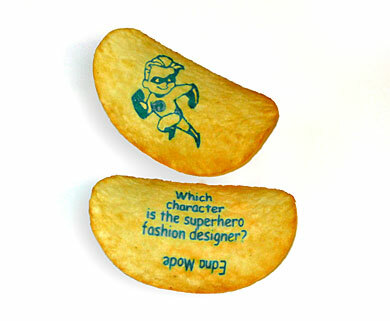 You can scratch that off your list of, “Things To Invent”… Pringles Prints are made using a proprietary technology where words and images can be printed on one side of the crisp right side up, upside down, in blue or red. This technology is the first-of-its kind in the U.S. to be used on food. The technology uses food coloring and doesn’t alter the delicious taste of this popular snack. For now, Pringles Prints will be available in Original flavor only in canister and Snack Stacks sizes. These aren’t for the super rich either, Pringles Prints in Canisters and Snack Stacks have a suggested retail price equivalent to other Pringles products of similar size and in the future, Pringles Prints introductions will feature new printing colors, designs, images and innovative partnerships. Oh, boy… I can’t wait… riiight.